Probably already suggested before so i'm sorry if I'm being a dumbass uninformed and spamming repeated suggestions, but should we ever expect a Plane Select screen for the player more akin to the one seen in the Battle Scenario and Campaign modes? It's a minor feature but adds to the value of seeing the actual plane and SP weapon (if enabled), as well as their stats, so that it helps clearing things up if you're not sure what you're looking at from a text drop-down list (given the behemoth amount of variants, it's easy to get things mixed up). I also read some other threads around and I think it would be proper to limit this function to player's if szboudreau's ideas from In Depth Skirmish creator thread are ever applied, so you don't need to pick each plane manually for every AI pilot. Though a visual selection system for only your own squadron/AI teammates a-la AC5 could possibly work. 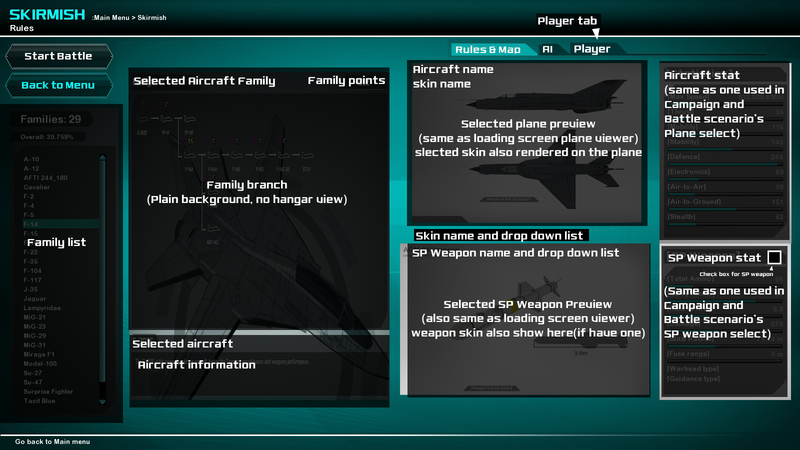 For the plane select in skirmish, I wont recommend the full 3D model rotating plane select screen, maybe a window or a portion of the skirmish screen or a menu even a tab dedicated to the player's plane and loadout showing the plane you've selected along with its skin(like the ones shown in the loading screen with the side and top view) with stats beside. As for selecting llanes and skins(and SP weapons) it will be nice to categorize in families but still in lists(default to all) or similar to the usual battle scenario and campaign plane select(controller friendly) but with like what've stated above a bit save on the rendering. 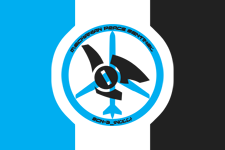 As for the AI pilots however I dont have any thoughts on that. I wonder when/how soon TS will start looking on other modes aside of campaign though. Currently it's as if the campaign is his one and the only priority so far. Cant argue about that, besides the camaign is most probably some new guy who wanted cockpit view and runway/carrier landing and areal refueling would most likely to press/try first. About this suggestion, maybe something like the Challenge mode menu? Actually I´m going to try to add this tomorrow and when I have something ready to show I´ll write a report about t.
As for the campaign, yes I do admit in this update I have given more emphasis in the campaign, mostly because I felt it was missing a bit more cafe before I could more to other game modes. That's sounds plausible. Perhaps you can make it render the selected plane along with main + selected special weapon too. that could work, though the 3D hangar model is not well suited for skirmish, maybe some portion of the tab/screen showing the selected plane and it's weapon in the form similar to the plane and weapon viewer on the loading screens. Man, that mockup makes me really want more granular options for the AI tab, both with team selection/aircraft/loadout assignment and behavior controls. it took me about half an hour to finish it(including that time I accidentally closing it without saving it), just cut and paste components/assets from all over the game(loading screens, challenge mode menus and battle scenario menus) though one issue could come with this kind of setup, Most window/menu are slightly resized to fit 1600x900 and any resolution below could get misaligned/overlapping other components/window/menu. What would be really nice would be being able to save custom profiles under a player defined name which contains aircraft model, loadout, skin, voicepack etc. and then being able to just click on the profiles to define the parameters that the player tends to have to spend minutes fiddling with. Going into skirmish and simply clicking a "Mobius" profile in the player tab, then clicking the "Yellow" profile five times in the AI pane would be more streamlined than picking weapons and skins for each individually (if we ever get the option to tweak enemy loadouts and skins). Bonus points if we're able to save profiles into groups sub groups sorta like file folders. For example, a HT folder would contain profiles for the big players of HT like the Prince and Fennec Squad. Also, would we be able to get the ability to set ourselves as neutral?